Today, Thursday, January 16, 2014, Commissioner’s Commendations were awarded to District C-6 Officers Allison McHale & Casey McDonough: On December 10, 2013, Officers McHale & McDonough responded to a call for a person stealing UPS packages from residences in the area of 616 East 6th Street in South Boston. While en route to the call, officers observed an individual in the area of K & Emerson Streets who matched the description of the suspect. As such, officers promptly approached the suspect. When asked to explain what he was doing in the area, the suspect was evasive and vague in his answers. A search of the area enabled officers to locate several discarded packages, some under parked cars, addressed to residents in the immediate area. Further investigation revealed that the suspect was in possession of a UPS shipping receipt that accompanied one of the stolen packages. It was later learned that most of the recovered packages were Christmas presents. 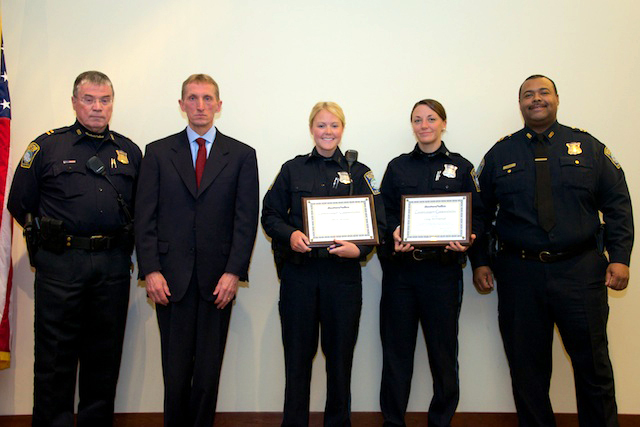 For their quick response and keen observation skills, we say thank you to Officers McHale & McDonough.